A MPO fiber optic cassette for a 3 bay interchangeable patch panel with 2 MPO in and 12 LC duplex out, Multimode Duplex OM3. 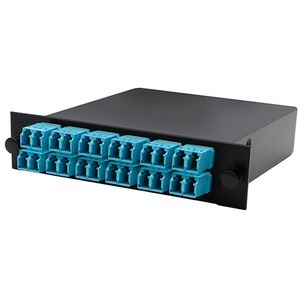 It is a highly flexible fiber management unit that can be used stand alone or integrated into the MPO fiber optic patch panels. We supply a high quality MPO cassette which is designed to reduce installation time and cost for an optical network infrastructure in the premises environment.